Oh! wonderful! They are so cute! And I am always so touched how MM and H love eachother! Would like to see Sverre walking, though. Lovely pics! Would have liked to have seen more of little Sverre's face. In most of the pics he's looking away. Thanks for the wonderful pics!!! so lovely pix! Thank you everybody! Sverre is a sweet baby !!!! They are so cute especialy Sverre!!! I like this great photos. Thanks for them. Maybe, you can put more. Are there any pictures of them in the snow?Skiing ? No, they weren't skiing. They just watched the ski-jumping. The King and Queen, The Crown Prince and Crown Princess, Princess Astrid, Mrs Ferner will attend the traditional Holmenkollen Ski Jumping Festival. I just heard that the weather is Oslo next Sunday is supposed to be vey bad; so the annual Holmenkollen-Skijumping might be cancelled. Queen Margrethe II of Denmark will attend as well. Today the King and Princess Astrid attended the Country Cross Skiing Competition at the Holmenkollen. Former Norwegian skier Bjoern Daehlie was awarded the price for 'Best Norwegian skier of all time' by Harald, the king of Norway in Holmenkollen, Norway, 08 March 2008, on the occassion of the Cross County World Cup. King Harald was today in Holmenkollen at the Nordic ski World Cup. 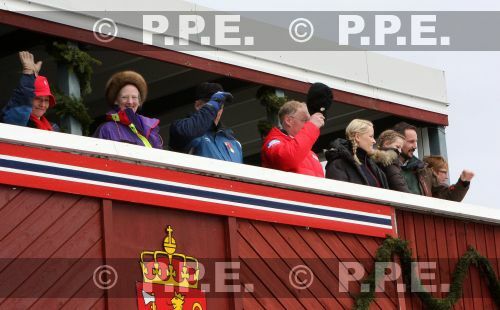 The Norwegian Royals , as well as Queen Margrethe II, already arrived at the skijump. The competition is about to start in half an hour. Thank you sooo much for all the pictures. This is a lovely day for the family. QM cant go missing with her colorful ski jacket. 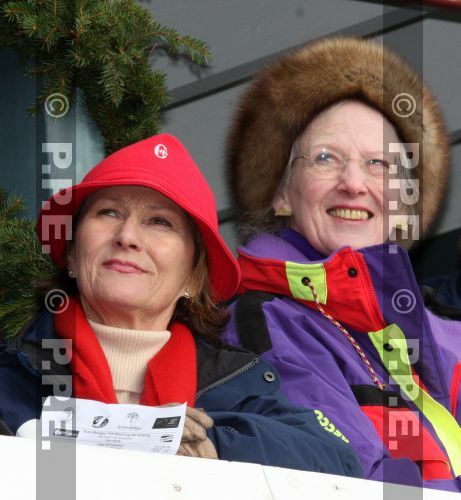 The pictures of Queen Sonja & QM together are sweet. Interesting how both Mummy and Ingrid ended with braids. It's actually the last time that the old Holmenkollen is being jumped in, in a competition, if I remember right. They're starting renovations, and expansions soon to meet the demands from the ski-jump federation.